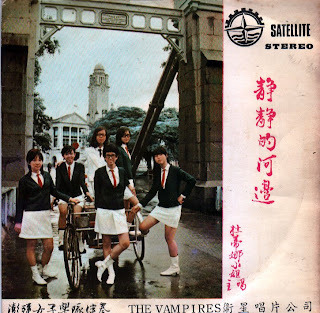 The Vampires were an all-girl group in the Singapore 60s music scene. According to the sleeve (paraphrased and roughly translated with assistance): this EP features Du Di Na on vocals, backed by The Vampires. Du Di Na joined The Vampires as singer 2 years prior to the release of this EP, and the group has won many fans among the young. Interesting side note: the above picture was taken at Cavenagh Bridge, which is still standing in Singapore today. That song is actually pretty cool. Thanks for posting it! BEAT IS ALL WE NEED! Yup, the bridge is still there, that's the new cultural museum behind them and behind the photographer is the Fullerton Hotel. Oh yeah, groovetastic blog btw ! Nice Track and nice cover! Thanks!! This has a very interesting sound, I wonder still why they call themselves Vampires, i don't look at any Vampire reference on their look and music. This is the best ever site I see. The articles are very informative. Fantastic, the post is really the sweetest on this worthwhile topic. I fit in with your conclusions and will eagerly look forward to your approaching updates. Saying thanks will not just be sufficient, for the exceptional clarity in your writing. I will immediately grab your rss feed to stay privy of any updates. I read a lot of helpful info in this post! What an amazing job you people are doing. Hope to see latest information. Thanks for creating this wonderful site! It help me a lot. Good luck for a great job done! This is the type of information that should gain recognition for it’s craft. More writers should learn from you. This is right on the money. Gr8 job and a nice post I must say. Thanks a ton for this thing. Great review as always ,Thanks for sharing information. Read, of course, far from my topic. But still, we can work together. How do you feel about trust management??? this is the info i was looking for, thanks for sharing man! lolwa to the post bt I must say its very informative to read ^_^ way to go owner.. cheers! The Vampires were great in those days. Some useful michael jackson red jacket stuff you have listed here. This is same stuff what i was wolverines leather jacket searching for. You bangkok jacket helped me a lot indeed and reading this your article I have found many new and useful information dr who leather jacket about this subject. This information is very interesting, I really enjoyed, thanks for sharing! This is the best ever site I see.I wonder still why they call themselves Vampires, i don't look at any Vampire reference on their look and music. Advance Lock & Key - click here gold coast locksmithoffer a reliable Locksmith service on the Gold Coast which includes the supply and fit of deadlocks and window locks, key cutting, keys made to locks, locked out service and Pensioner discounts. That song is actually pretty cool.I like it!!! Nice Track and nice cover! This has a very interesting sound,I love that song very cool!!! Harts Cool party hire Melbourne offers full logistical support for any size Event Hire or Party Hire. We have over 200 sizes of marquee hire Melbourne and long term marquee hire Melbourne is available. Amazing article! It’s just what I needed to understand.Among the verity of blogs your written blog is unique one. It’s a very good idea to hire a professional like fort collins carpet cleaning, seeing as your carpet is such a huge investment. Nice Track and nice cover!Best Wishes to both of you. I love this song!!! Very meaningful relics. I love all those song of this group..
A heating and also air conditioning system could be provided by click here party hire Melbourne for their marquees. Nice track and nice cover! Thank you for sharing. I am not sure where you're getting your info, but great topic. I needs to spend some time learning more or understanding more. This has a very interesting sound, I wonder still why they call themselves Vampires. listed on our online directory are prompt, reliable, honest, clean and tidy and that they communicate openly and friendly with all clients. We use only high grade disinfectants and cleaning agents to properly sanitize the affected area. J & E Cleaning Services -great sunshine coast carpet cleaning, are an elite company using state of the art professional equipment to get the job done. I’m not that much of a online reader to be honest but your blogs really nice, keep it up! I'll go ahead and bookmark your site to come back later. Many thanks Effects Of Smoking. You write well, but in the first paragraph I'm not really sure what's going on. Perhaps you could make a prologue to explain the characters? Great stuff you should write more often.. Thanks for your your content – really interesting. We love our Kindle and the best site for tips and tricks is cool kindles. Is the basement sealed? I have heard of problems in new construction, where houses are built so tight now days, that these sealed water heaters are shutting down from lack of combustion air. Maybe a fresh air intake flue is needed. Have these customer rep's actually visited your house, or are they diagnosing over the phone? Ask them to send a certified installer to assess the situation. He will be able to ascertain if your heater is defective or not. Good luck! That song is actually pretty cool. I love it. It was much useful to your site followers. I appreciate you for sharing it with us. Thanks a ton!! This blog is an exact representation of skills. I appreciate the blogger for posting the most excellent thought. This topic posted by you is trustworthy. I like you recommendation. All files are available for a limited period only. If I am infringing on any copyright of yours, email me and I'll take the files down. If you love the artists featured here, please support them and buy their releases!